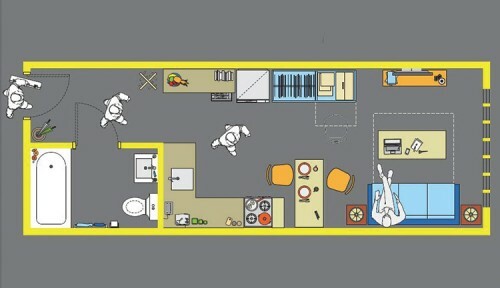 Take a minute to imagine what you would do if you had to cram your life into 270 square feet. In a typical ranch-style home, 270 could be a master bedroom, or a small living room, or a one-car garage. Now how about 220 square feet? It might make a shed or a bedroom. Now imagine this 15 by 18 foot or 15 by 15 foot space as your home. Though it might sound more like another Ikea advertisement, two high-rent cities—New York and San Francisco—have been playing with the concept of permitting very small “micro-apartments” to alleviate high rents. By creating smaller housing, the idea goes, prospective renters will have a less expensive option and the city will be able to increase the density of residential units without increasing building size, always a contested point in neighborhood planning. On the West Coast, Berkeley developer Patrick Kennedy is advocating for his “SmartSpace” concept for San Francisco, the San Francisco Chronicle reports. Each unit would have 150 square feet of living space with a kitchen, bathroom, and closet giving the apartment a total of 220 square feet. It has been rumored that San Francisco Supervisor Scott Wiener will bring a proposal to reduce the minimum-square-footage zoning requirement—currently 280 square feet—to the city’s Board of Supervisors though nothing has been released by the San Francisco City Council. 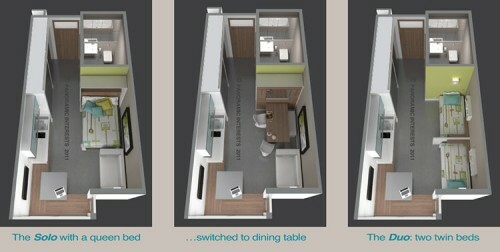 In New York, Mayor Bloomberg and the Department of Housing Preservation and Development (HPD) have proposed a micro-living model for New York City, and they recently announced an open competition—called “adAPT NYC”—for a micro-unit building to be built in Kips Bay on the east side of Manhattan. With accompanying site-specific waivers for zoning regulations for residential density and minimum-dwelling-unit size, the city government’s proposal has retained a larger amount of control over what they consider to be a pilot project. The attention given these two projects on either coast reflects both the micro-unit’s potential as a solution for New York and San Francisco’s frenzied rental markets, as well as society’s interest in a form of housing yet unexplored in U.S. cities. The most immediate concern raised by architects attending an NYC HPD pre-submission conference held at the Center for Architecture is the qualifications written into the adAPT NYC competition. Among other required developer qualifications, the evaluation criteria of the competition, only 30 percent consideration is given to the design. The price offered to the city for the city-owned land gets ten percent, giving wealthy developers an edge. Meanwhile, the size of the property constrains the scale of the project. A mock-up by HPD shows only eight units per floor and an overall program of seven residential floors, making the scale too small to entice wealthy developers or make a substantial impact on affordable housing in the city. Overall, the restrictions overshadow innovation. A more embedded issue with the development of smaller spaces is how a change in apartment size functions within the larger regulatory system. Regulations, such as those associated with the Americans with Disabilities Act and other codes, put stringent requirements on design, potentially restricting the possible solutions for addressing the design of an apartment within such a small area. 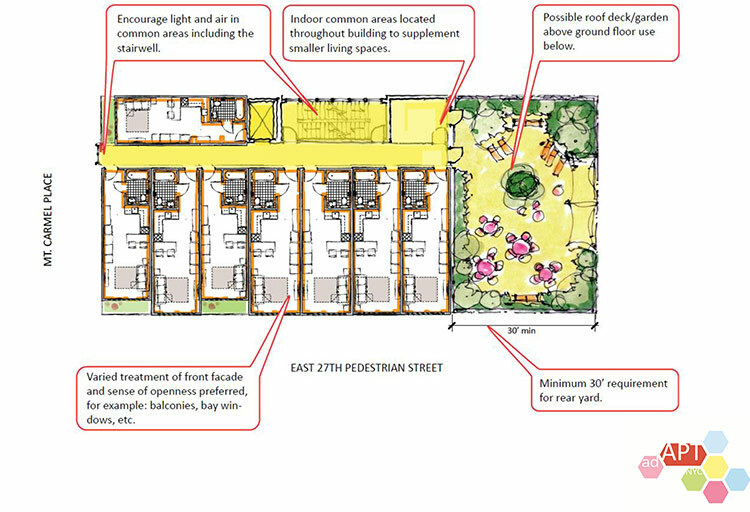 Another objection addresses yet another nebulous consideration: can a 220-square-foot space be sufficient for occupants? Not only does this question hinge, quite literally, on multipurpose design elements such as the bed/shelf/couch or kitchen/workspace/storage combinations, but on quality of life questions. Common amenities are suggested as a solution to small apartments, such libraries, gyms, game rooms, and home theaters. But including common rooms compromises the inclusion of more apartments. I’m so glad you could make it to my microhousewarming. Ha-ha, no, there’s still going to be a lot of fun, I’m just calling it that because of how much I’m loving my new Kips Bay-area, Bloomberg-administration-ordered, 275-square-foot microapartment. You can put your coat right … there on your shoulders! Please keep your coat on. One of Gerald’s friends brought a hat, so unfortunately space is a bit tight in the closet.